The mission of First Texas Bank is to provide complete, convenient financial coverage and service by fostering uncompromising customer delight in the Williamson County area, delivered by a team of dedicated, friendly and caring professionals. First Texas Bancorp will be recognized as the premier provider of financial service among all financial institutions located in each bank’s local community, characterized by responsive professional services and people to nurture ourselves and the respective communities we serve. 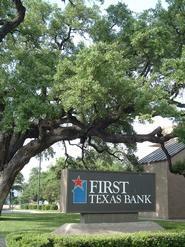 First Texas Bank has proudly supported the greater Williamson County area and provided banking services to its citizens and businesses since 1898. The bank’s original charter number 17, which we still hold, is now the 2nd oldest charter in the state. We strive to provide a complete range of services to enhance your financial needs. With 8 bank locations in 6 different communities, extended hours, free online banking and consumer bill pay, mobile banking, and a 24-hour telephone account information line, we believe First Texas Bank is your personal & business advantage. We’re proud of our history and our neighbors. Our commitment to you is that we will handle your accounts in a professional and friendly manner. We’ll treat you like family. After all, it’s our community too!